Andrew Geoghegan Launches Chapiteau Collection. Chapiteau is inspired by Versailles and alive with the flamboyant decadence of its architect, Louis XIV. There are two sides to the Chapiteau collection, which blends the spectacle of unrestrained colour and radiance, and an elegant homage to the stately beauty and distinction of the hexagon. An ornate paen to unashamed opulence and the theatre of beautiful jewellery, the Chapiteau is as lavish and exuberant as it is gently mesmerising. 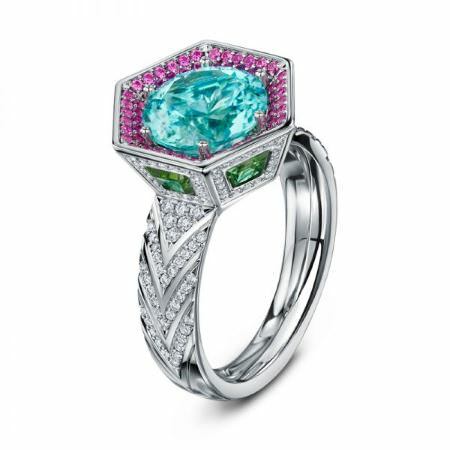 Every facet of the breathtaking Chapiteau de Paraiba Cocktail Ring is a canvas for an extravagant collection of stones, the angles of the hexagonal setting echoed in falling chevrons of diamonds through the band. Chapiteau’s lavish, angular centre uses depth, space and light to add drama to an irresistibly alluring blue Paraiba tourmaline, lauded above a coterie of glimmering pink sapphires. Each of the hexagon’s six panels hosts a cool, mint green tourmaline framed by an abundance of diamond light.